The first quarter of the year is the biggest slump time for movie theatres. (1) Holiday fatigue, thin budgets, bad weather, the Super Bowl, and the distractions of the awards season depress admissions. If people go to the movies, they tend to catch up on Oscar nominees, and studios don’t want to release high-end films that might suffer from the competition. But screens need fresh product every week, so most of what gets released at this time of the year might charitably be called second-tier. More important, these winter orphans are often more experimental, imaginative, and peculiar than the summer blockbusters. On low budgets, people take chances. Some examples, not all good but still intriguing, would be Wild Things (1998), Dark City (1998), Romeo Must Die (2000), Reindeer Games (2000), Monkeybone (2001), Equilibrium (2002), Spun (2003), Torque (2004), Butterfly Effect (2004), Constantine (2005), Running Scared (2006), Crank (2006), and Smokin’ Aces (2007). The mutant B can be found in other seasons too—one of my favorites in this vein, Cellular (2004), was released in September—but they’re abundant in the year’s early months. By all odds, Cloverfield ought to have been another low-end release. A monster movie with unknown players, running a spare 72 minutes sans credits, budgeted at a reputed $25 million, it’s a paradigm of the winter throwaway. Except that it pulled in $46 million over a four-day weekend and became the highest-grossing film (in unadjusted dollars) ever to be released in January. Here the B in “B-movie” stands for Blockbuster. I enjoyed Cloverfield. It starts with a sharp premise, but as ever, execution is everything. I see it as a nifty digital update of some classic Hollywood conventions. Needless to say, many spoilers loom ahead. Everybody knows by now that Cloverfield is essentially Godzilla Meets Handicam. A covey of twentysomethings are partying when a monster attacks Manhattan, and they try to escape. One, Rob, gets a phone call from his off-again lover Beth, who’s trapped in a high-rise. He vows to rescue her. He brings along some friends, one of whom documents their search with a video camera. It’s a shooting-gallery plot. One by one, the characters are eliminated until we’re down to two, and then. . . .
Cloverfield exemplifies what narrative theorists call restricted narration. (Kristin and I discuss this in Chapter 3 of Film Art.) In the narrowest case of restricted narration, the film confines the audience’s range of knowledge to what one character knows. Alternatively, as when the characters are clustered in the same space, we’re restricted to what they collectively know. In other words, you deny the viewer a wider-ranging body of story information. 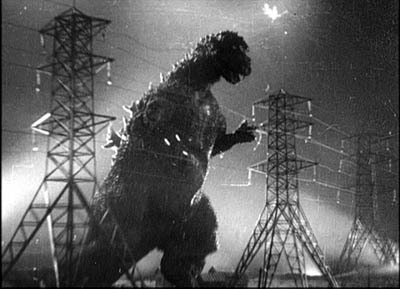 By contrast, the usual Godzilla installment is presented from an omniscient perspective, skipping among scenes of scientists, journalists, government officials, Godzilla’s free-range ramblings, and other lines of action. Instead, Cloverfield imagines what Godzilla’s attack would look and feel like on the ground, as observed by one group of victims. Horror and science fiction films have used both unrestricted and restricted narration. A film like Cat People (1942) crosscuts what happens to Irena (the putative monster) with scenes involving other characters. Jurassic Park and The Host likewise trace out several plot strands among a variety of characters. The advantage of giving the audience so much information is that it can feel apprehension and suspense about what the characters don’t know is happening. Our superior knowledge can make us worry about those poor victims oblivious to their fate. But these genres have relied on restricted narration as well. Invasion of the Body Snatchers (1956) is a good example; we are at Miles’s side in almost every scene, learning of the gradual takeover of his town as he does. Night of the Living Dead (1968), Signs (2002), and War of the Worlds (2005) do much the same with a confined group, attaching us to one or the other momentarily but never straying from their situation. The advantages of restricted narration are pretty apparent. You can build up uncertainty and suspense if we know no more than the character(s) being attacked by a monster. You can also delay full revelation of the creature, a big deal in these genres, by giving us only the glimpses of it that our characters get. Arguably as well, by focusing on the characters’ responses to their peril, you have a chance to build audience involvement. We can feel empathy and loss if we’ve come to know the people more intimately than we know the anonymous hordes stomped by Godzilla. Finally, if you need to give more wide-ranging information about what’s happening outside the characters’ immediate situation, you can always have them encounter newspaper reports, radio bulletins, and TV coverage of action occurring elsewhere. The point of view was so restricted, it felt really fresh. It was one of the things that attracted me [to this project]. You are with this group of people and then this event happens and they do their best to understand it and survive it, and that’s all they know. Restricted narration doesn’t demand optical point-of-view shots. There aren’t that many in Invasion of the Body Snatchers or the other examples I’ve indicated. Still, for quite a while and across a range of genres, filmmakers have imagined entire films recording a character’s optical/ auditory experience directly, in “first-person,” so to speak. Hollywood’s most strict and most notorious example of directly subjective narration is Robert Montgomery’s Lady in the Lake (1947). Its strangeness reminds us of some inherent challenges in this approach. How do you show the viewer what your protagonist looks like? (Have him pass in front of mirrors.) How do you skip over the boring bits? (Have your hero knocked unconscious from time to time.) How do you hide the inevitable cuts? (Try your best.) Even Montgomery had to treat the subjective sequences as long flashbacks, sandwiched within scenes of the hero in his office in the present telling us what he did next. Because of these problems, a sustained first-person immediate narration is pretty rare. The best compromise, exploited by Hitchcock in many pictures and especially in Rear Window (1954), is to confine us to a single character’s experience by alternating “objective” shots of the character’s action with optical point-of-view shots of what s/he sees. What I’m calling immediate optical point of view is just that: sight (and sounds) picked up directly, without a recording mechanism between the story action and the character’s experience. But we can also have mediated first-person point of view. The character uses a recording technology to give us the story events. In a brilliant essay on the documentary Kon-Tiki (1950), André Bazin shows that our knowledge of how Thor Heyerdahl filmed his raft voyage lends an unparalleled authenticity to the action. Heyerdahl and his crew weren’t experienced photographers and seem to have taken along the 16mm camera as an afterthought, but the very amateurishness of the enterprise guaranteed its realism. Its imperfections, often the result of hazardous conditions, were themselves testimony to the adventure. When the men had to fight storms, they had no time to film; so Bazin is able to argue, with his inimitable sense of paradox, that the absence of footage during the storm is further proof of the event. If we were given such footage, we might wonder if it was staged afterward. What about fictional events? In the 1960s we started to see fiction films that presented themselves as recordings of the events as the camera operator experienced them. One early example is Stanton Kaye’s Georg (1964). 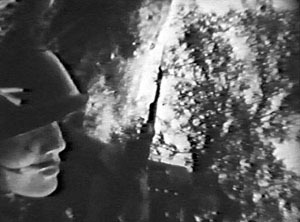 The first shot follows some infantrymen into battle, but then the framing wobbles and the camera falls to earth. We see a tipped angle on a fallen solider and another infantryman approaches. As lightweight 16mm cameras made filming easier, directors adapted that look and feel to fictional storytelling. The arrival of ultra-portable digital cameras and cellphones has launched a similar cycle. 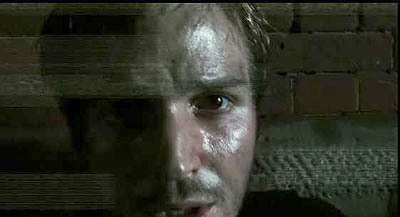 Brian DePalma’s Redacted (2007), yet another war film, has exploited the technology for docudrama. A digital equivalent of David Holzman’s Diary, apart from Webcam and YouTube material, is Christoffer Boe’s Offscreen (2006), which I discussed here. Interestingly, Orson Welles pioneered both the immediate and the mediated subjective formats. One of his earliest projects for RKO was an adaptation of Heart of Darkness, in which the camera was to represent the narrator Marlowe’s optical perspective throughout. (5) Welles had more success with the mediated alternative, though in audio form. His “War of the Worlds” radio broadcast mimicked the flow of programming and interrupted it with reports of the aliens’ attack. The device was updated for television in the 1983 drama Special Bulletin. 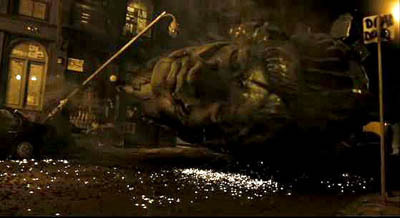 Cloverfield, then, draws on a tradition of using technologically mediated point-of-view to restrict our knowledge. Like The Blair Witch Project (1999), it does this with a horror tale. But it’s also a Hollywood movie, and it follows the norms of that moviemaking mode. So the task of Reeves, producer J. J. Abrams, and the other creators is to fit the premise of video recording to the demands of classical narrative structure and narration. How is this done? First, exposition. 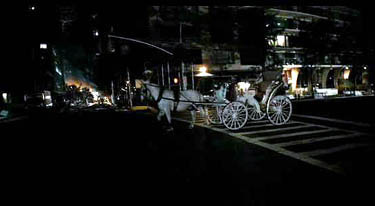 The film is framed as a government SD video card (watermarked DO NOT DUPLICATE), the remains of a tape recovered from an area “formerly known as Central Park.” This is a modern version of the discovered-manuscript convention familiar from the nineteenth-century novel. When the tape starts, showing Rob with Beth in happy times, its read-out date of April plays the role of an omniscient opening title. In the course of the film, the read-outs (which come and go at strategic moments) will tell us when we’re in the earlier phase of their love affair and when we’re seeing the traumatic events of May. Likewise, the need for exposition about characters and relationships at the start of the film is given through a basic premise. Jason wants to record Rob’s going-away-party and he presses Rob’s friend Hud into service as the cameraman. Off the bat, Hud picks out our main characters in video portraits addressed to Rob. 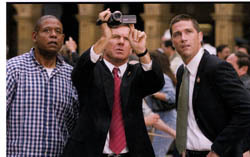 What follows indicates that Hud will be amazingly prescient: His camera dwells on the characters who will be important in the ensuing action. *A development section lasting about 22 minutes. This is principally a series of delays. Rob, Hud, Lily, and Marlena encounter obstacles. Marlena falls by the wayside. They are given a deadline: At 0600 they must meet the last helicopters leaving Manhattan. *A climax lasting about 20 minutes. The group rescues Beth and meets the choppers, but the one carrying Rob, Hud, and Beth falls afoul of the beast. 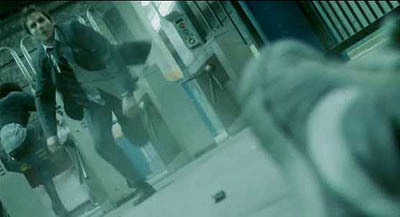 They crash in Central Park, and Hud is killed, his camera recording his death at the jaws of the monster. Huddled under a bridge, Rob and Beth record a final video testimonial before an explosion cuts them off. *An epilogue of one shot lasting less than a minute: Rob and Beth in happier times on the Ferris wheel at Coney Island—a shot left over from the earlier use of the tape in April. Next, local structure and texture. It takes a lot of artifice to make something look this artless. The imagery is rich and vivid, the sharpest home video you ever saw. The sound is pure shock-and-awe, bone-rattling, with a full surround ambience one never finds on a handicam. (6) Moreover, Hud is remarkably lucky in catching the turning points of the action. All the characters’ intimate dramas are captured, and Hud happens to be on hand when the head of Miss Liberty hurtles down the street. Bazin points out that in fictional films the ellipses are cunning gaps, carefully designed to fulfill narrative ends—not portions left out because of the physical conditions of the shoot. Here the cunning gaps are justified as constrained by the physical circumstances of filming. When Hud doesn’t show something, it’s usually because it’s what the genre considers too gross, so the worst stretches take place in darkness, or offscreen, or strategically shielded by a prop when the camera is set down. Mostly, though, Hud just shows us the interesting stuff. He turns on the camera just before something big happens, or he captures a disquieting image like that of the empty Central Park carriage. At least once, the semi-documentary premise does yield something evocative of the Kon-Tiki film. Hud has to leap from one building to another, many stories above the street. He turns the camera on himself: “If this is the last thing you see, then I died.” He hops across, still running the camera, but when a rocket goes off nearby, a sudden cut registers his flinch. For an instant out of sheer reflex, he turned off the camera. Overall, Hud’s tape respects the flow of classical film style. Unlike the Lady in the Lake approach, the mediated POV format doesn’t have a problem with cuts; any jump or gap is explained as a moment when the operator switched off the camera. Most of Hud’s “in-camera” cuts are conventional ones, skipping over a few inconsequential stretches of time. There are as well plenty of hooks between scenes. (For more on hooks, go here.) Hud says: “I’ll walk in the tunnels.” Cut to characters walking in the tunnels. More interestingly, visible cuts are rare, which again respects the purported conditions of filming. Cloverfield has much longer takes than any recent Hollywood film I know. I counted only about 180 shots, yielding an average of 24 seconds per shot (in a genre in which today’s films average 2-5 seconds per shot). We could find plenty of other ways in which Cloverfield adapts the handicam premise to the Hollywood storytelling idiom. There are the product placements that just happen to be part of these dim yuppies’ milieu. There are the character types, notably the sultry Marlena and the hero’s weak friend who’s comically a little slow. There’s the developing motif of the to-camera addresses, with Rob and Beth’s final monologues to the camera counterbalancing the party testimonials in the opening. There’s the final romantice exchange: “I love you.” “I love you.” The very last shot even includes a detail that invites us to re-view the entire movie, at the theatre or on DVD. But let me close by noting how some specific features of digital video hardware get used imaginatively. I’ve already mentioned how the viewfinder date readout allows us to keep the time structure clear. There’s also the use of a night-vision camera feature to light up those spidery parasites shucked off by the big guy. Which scares you more—to glimpse the pinpoint eyes of critters skittering around you in the dark, or to see them up close in a sickly green light? More teasing is the fact, set up in the first part, that this video is being recorded over an old tape of Rob’s. That’s what turns the opening sequence of Rob and Beth in May into a prologue: the tape wasn’t rewound completely for recording the party. Later, at intervals, fragments of that April footage reappear, apparently through Hud’s inadvertently advancing the tape. The snippets functions as flashbacks, showing Rob and Beth going to Coney Island and juxtaposing their enjoyable day with this horrendous night. Cleverly, on the tape that’s recording the May disaster something always prepares the audience for the shift. For instance, when Jason hands the camera over, we hear Hud say, “I don’t even know how to work this thing.” Cut to an April shot of Beth on the subway, suggesting that he’s advanced fast forward without shooting. Likewise, when Rob says, “I had a tape in there,” we cut to another April shot of Beth. As a final fillip, the footage taken in May halts before the tape ends, so we get the epilogue showing Rob and Beth on the Ferris wheel in April, emerging like figures in a palimpsest. No less clever, but also a little poignant, is the use of the fallen-camera convention. It appears once when Beth has to be extricated from her bed. Hud sets the camera down by a concrete block in her bedroom, which conceals her agony. More striking is the shot when the camera, dropped from Hud’s hand, lies in the grass, and the autofocus device oscillates endlessly, straining to hold on his lifeless face. The fun of this movie was that it might not have been the only movie being made that night, there might be another movie! In today’s day and age of people filming their lives on their iPhones and Handycams, uploading it to YouTube. . . . So the Dead Zone of January through March yields another hopeful monster. What about next month’s Vantage Point? The tagline is: 8 Strangers. 8 Points of View. 1 Truth. Hmmm. . . . Combining the network narrative with Rashomon and a presidential assassination. . . . Bet you video recording is involved . . . . See you there? PS: At my local multiplex, you’re greeted by a sign: WARNING: CLOVERFIELD MAY INDUCE MOTION SICKNESS. I thought this was just the theatre covering itself, but I’ve learned that no recent movie, not even The Bourne Ultimatum, has had more viewers going giddy and losing their lunch. You can read about the phenomenon here, and Dr. Gupta weighs in here. My gorge can rise when a train jolts, but I had no problems with two viewings of Cloverfield, both from third row center. Anyhow, it will be perfectly easy to watch on your cellphone. But we should expect to see at least one pirate version shot in a theatre by someone who’s fighting back the Technicolor yawn, giving us more Queasicam than we bargained for. (1) The only period that rivals this slow winter stretch is mid-August to October, when genre fare gets pushed out to pick up on late summer business. [Added 26 January:] There are, I should add, two desirable weekends in the first quarter, those around Martin Luther King’s birthday and Presidents’ Day. Studios typically aim their highest-profile winter releases (e.g., Black Hawk Down, 2001) for those weekends. (2) Joris Ivens, The Camera and I (New York: International Publishers, 1969), 42. (3) André Bazin, “Cinema and Exploration,” What Is Cinema? Vol. 1, trans. and ed. Hugh Gray (Berkeley: University of California Press, 1967), 162. (4) Not all pseudodocumentaries present themselves as records of a person’s observation. Milton Moses Ginsberg’s Coming Apart (1969) presents itself as an objective record, by a hidden camera, of a psychiatrist’s dealings with his patients. Like a surveillance camera, it doesn’t purport to embody anybody’s point of view. (5) Jonathan Rosenbaum, Discovering Orson Welles (Berkeley: University of California Press, 2007), 28-48. (6) For Kevin Martin’s informative account of the film’s polished lighting and high-definition video capture, go here (and scroll down a bit). For discussions of contemporary sound practices in this genre, see William Whittington’s Sound Design in Science Fiction (Austin: University of Texas Press, 2007). PS: Thanks to Corey Creekmur for correcting two slips in my initial post! PPS 28 January: Lots of Internet buzz about the film since I wrote this. Thanks to everyone who linked to this post, and special thanks for feedback from John Damer and James Fiumara. Some people have asked me to comment on the social and cultural implications of Cloverfield’s references to 9/11. At this point I think that genre cinema has dealt more honestly and vividly with the traumas and questioning around this horrendous event than the more portentous serious dramas like United 93, World Trade Center, and the TV show The Road to 9/11. The two most intriguing post-9/11 films I know are by Spielberg. The War of the Worlds gives a really concrete sense of what a hysterical America under attack might be like, warts and all. (It reminded me of a TV show I saw as a kid, Alas, Babylon (1960), a surprisingly brutal account of nuclear-war panic in suburbia.) Spielberg’s underrated The Terminal reminds us, despite its Frank Capra optimism, that the new Security State is run by bureaucrats with fixed agendas and staffed by overworked people of color, some themselves exiles and immigrants. I think that Cloverfield adds its own dynamic sense of how easily the entitlement culture of upwardly mobile twentysomethings can be shattered. Genre films carry well-established patterns and triggers for feelings, and a shrewd filmmaker can channel them for comment on current events—as we see in the changing face of Westerns and war films in earlier phases of Hollywood history. On this point, Cinebeats offers some shrewd responses to criticisms of Cloverfield here. Finally: In the new Creative Screenwriting an informative piece (not available online) indicates that the initial logline for Vantage Point on imdb is misleading. Screenwriter Barry Levy planned to present the assassination from seven points of view, but reduced that to six. As for my speculation that video recording/replay would be involved, a production still seems to offer some evidence. Shall we call it the Cloverfield effect? The same issue of CS has a brief piece on the script for Cloverfield. PPS 30 January: Shan Ding brings me another story about the making of Cloverfield, and Reeves is already in talks for a sequel, says Variety. PPPS 4 February: A recent story in The Hollywood Reporter offers a nuanced account of how Hollywood is rethinking its first-quarter strategies. Across the last 4-5 years, a few big releases have done fairly well between January and April; a high-end film looks bigger when there is less competition. The author, Steven Zeitchik, suggests that the heavy packing of the May-August period and the need for a strong first weekend are among the factors that will encourage executives to spread releases through the less-trafficked months. I hope, though, that tonier fare won’t crowd out the more edgy, low-end genre pieces that bring me in. PPPPS 8 February: How often has a wounded Statue of Liberty featured in the apocalyptic scenarios of comics and the movies? Lots, it turns out. Gerry Canavan explains here. This entry was posted on Friday | January 25, 2008 at 10:14 am	and is filed under B films, FILM ART (the book), Film comments, Film genres, Film history, Film industry, Film technique, Film technique: Cinematography, Hollywood: Artistic traditions, Hollywood: The business, Narrative strategies, New media: Technology, Readers' Favorite Entries, Screenwriting. Responses are currently closed, but you can trackback from your own site.